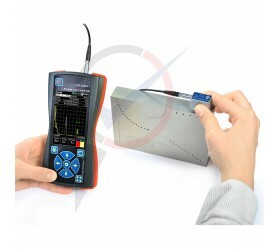 Ultrasonic flaw detector UD2301-mini is designed for nondestructive testing of metals, plastics, glass, composite materials, weld inspection and thickness measurement of the various products and structures. The Flaw detector allows user to detect various defects such as discontinuities, cracks and heterogeneity of materials in semi-finished products and welded joints, to measure the depth and coordinates of defects, the thickness of products, the speed of propagation and attenuation of ultrasonic vibrations (UT) in the material. Ultrasonic Flaw detector is produced in small housing of optimal size for performing testing in tight spaces. The device has colour display with high resolution (320*480 pixels), which significantly improves it’s usability.